Looking at the March 8 Astronomy Picture of the Day, Solar Eclipse Shoes in the Classroom, in preparation for this blog post brought back a vivid memory that I hadn’t thought about in years. Like the students in the photograph, I witnessed a partial solar eclipse in high school. We poked pinholes in sheets of paper to watch the sun’s projection change shape against a second sheet of paper without burning our eyes. Spots of sunlight filtering through the tree leaves shrunk to half circles, then banana slivers as the light took on a golden hue that was uncharacteristic for the middle of the day. Any time I feel anxiety over science programming, it’s helpful to remember how easy it can be. It doesn’t need to involve something as amazing as an eclipse. It doesn’t even need to be “programming,” it could simply mean asking teens, “Hey look at this cool/weird/mysterious thing, any guesses what it is?” Over the past year, the teens that visit my library have been entertained by a chunk of evaporating dry ice, helium-filled balloons, Pop Rocks, and vegetable oil + water + food coloring + alka-seltzer tablets in a bottle. 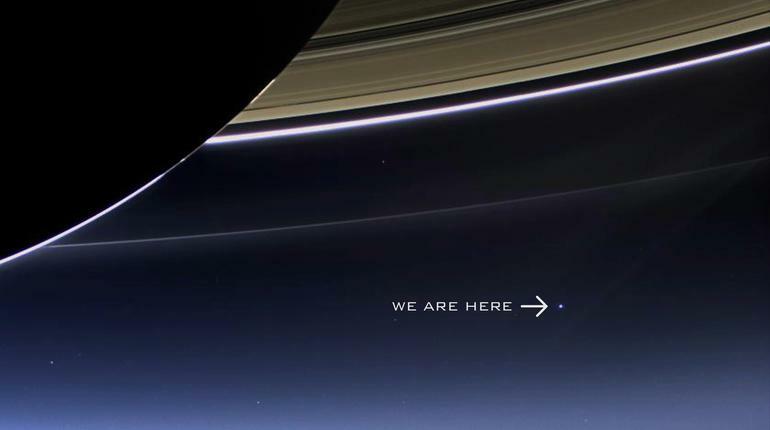 Earth, as viewed from the Cassini spacecraft as it passed near Saturn. Neil deGgrasse Tyson displayed the image during his 2015 tour. Astrophysicist Neil DeGrasse Tyson, one of my science heroes, gives advice to children who want to know what they can do to help the earth. Explore things, he tells them, do fun things even when it might annoy your parents. His advice to adults is to get out of their way. Kids are naturally curious about the world, and adults have a responsibility to not suppress that curiosity. Bill Nye, another science hero, encourages people of all ages to ask questions about the world around them (with the disclaimer to be aware of social interactions while doing so). By Linda W Braun December 20, 2012 December 21, 2012 YALSA Info. This weekend YALSA’s YA Literature Symposium takes place in St. Louis. The theme is The Next Big Thing. Last month YALSA’s The Hub blog had a set of great posts on the theme covering everything from e-reading, to science fiction, to why the next big thing isn’t important. This month in the YALSAblog series on Connect, Create, Collaborate we’ll also talk about The Next Big Thing. This week, what’s the next big thing in teen spaces? By Teen Space Guidelines Task Force June 11, 2012 July 5, 2012 YALSA Info. It has been a pleasure to help shape the National Guidelines for Teen Spaces in public libraries. The task force would like to thank the YALSA Board for giving us the opportunity to help define the standards for the teens who we all know and value. Hailing from a range of library environments (suburban, rural, urban), we were able to consider diverse service angles to create a document that would be accessible to all library staff working with teens. ‘ The guidelines offer suggestions for shaping spaces of all sizes by defining the essential characteristics for engagement in the space available. ‘ Because teens engage so heavily in digital media, we deemed it necessary to afford the same measure of attention to virtual spaces as physical space considerations. An important concept running through the guidelines is the idea of teen ownership in defining and maintaining both physical and virtual spaces. Teens are able to create content in any popular digital platform, it makes sense that teens would expect to do the same in their library’s virtual space and it makes sense for libraries to pay attention to this. Teens expect to be able to interact with digital content and share ownership of information relevant to them. The way teens interact with content in popular virtual environments should help define the way in which a library structures their online presence with teens. Simply feeding information through librarian created content is no longer an effective means of reaching teens and engaging them in the library’s virtual space. ‘ Giving teens leadership in creating library content gives them ownership of their library space. There are a range of possibilities for teens to create content for libraries : online book, music, game, website reviews, facebook pages, twitter feeds about library events or programs, how to videos for creating facebook cover photos, personalized google maps of your town/city. The key is what information is relevant to your teens, what kind of content do they want to create or learn to create and how can your library facilitate that to give them ownership of their space. How could your library give teens ownership of their virtual space? As mk notes in her CoveritLive post about yesterday’s awesome Innovations in Teen Services panel, I was scheduled to speak on the panel but was grounded at the airport for an unplanned six additional hours. While that’s a whole blog post in itself, and probably not even the worst flight horror story of the conference, I’d like to share a bit here what I did plan to present. Special thanks to my colleague, Catherine Haydon, ALA Emerging Leader, who stepped in at a moment’s notice and shared information regarding using outcomes with teens. You have the support of your library management, but you have no time, money, or space. How can you finally creating that teen space/center/area/room that you have been dreaming about? Well it won’t be easy. As a matter of fact, it will be dusty and heavy and time-consuming. But all good things are worth the effort! Once you have secured approval from your boss the planning process can begin. Review the following ideas and mix-and-match to your heart’s content! If the idea of empty shelves scares you, ask a maintenance worker to help you take (some or all of) the actual shelves out of the shelving unit. Use that space to publicize events and put up larger displays. Short on time? : Use volunteers! Teen volunteers are probably (hopefully?) the same teens that will be utilizing the Teen Space. Therefore, use them to help you shift. Offer volunteer/service hours or library card fine amnesty in return for their time. Idea #2: Have a Teen Center that pops up wherever you have space. If you can’t have permanent space in your building, plan a weekly pop-up in your library’s meeting room or children’s storytime room. Bring TVs and gaming systems, laptop computers, a cart of new YA books, craft supplies, etc. Move the day and time around as it suites the needs of your teens, but try to do this on a regular basis. Idea #3: Take that pop-up Teen Center to a local community center or school. Load up your car with all of the necessary equipment and set up shop in the non-library space. Plan this alongside a school’s afterschool tutoring program (maybe to begin immediately after tutoring sessions) and watch your attendance sky-rocket. While the teens play games, tell them about the library and invite them to visit and say hello to you next time they visit. 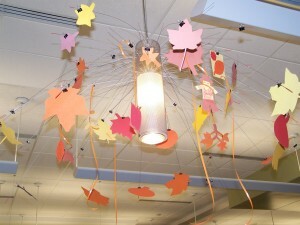 *Have a special treat to give to the teens that do visit the library and seek you out. If possible, give them a teen-friendly tour of the branch and maybe even introduce them to a couple co-workers. Prove to them that they are welcome. Idea #4: You know all those computers and comfy chairs in the adult area? Teens like those, too. Move a couple of each closer to the teen shelves. This encourages the teens to be comfortable in their own space, even if it’s a mere 20 feet from the adult area. Put a sign over the computers and chairs informing customers that they are for teens only (during non-school hours). *This will likely result in angry adult users once in a while. The â€œmy tax dollarsâ€ fight will begin, but if you and the entire staff stand your ground this won’t continue forever. Idea #5: If you have a bit of spare money (or receive a grant? Or win the lottery? Or acquire a millionaire benefactor?) purchase teen-friendly furniture and computers (Macs?) instead of just taking away from the adult area (a la idea #4). Put a plaque on the wall near all of this new stuff describing the area as a teen space and thanking those who supported it (Board, director, etc.). That way the teens and the adults who scope out the area know who it is for and why it is there. *Using private funds such as a donation or grant for these items will allow you to say, â€œThese were not purchased with tax dollars,â€ which is a great way to put the kibosh on the ol’ â€œmy tax dollars!â€ argument. Idea #6: Display YA books and program flyers in the places where the teens are (i.e computer banks, study carrels, etc.). Maybe the teens don’t know you own entire shelves of YA books, magazines, and audio books. A sign pointing them in the right direction will not only inform them, it will inform your community that your library cares for teens and wants to provide services specifically for them. Be creative with your displays (tape arrows to the floor to literally guide them to the materials). Idea #7: Even if you cannot shift books, set up a teen-only computer station, or buy comfy furniture to put near the teen stacks, you can make the teen stacks stand out. Cover the shelving units in bright colored paper. Have the teens make posters to tape to the shelves or hang from the ceiling over the shelves. The possibilities go on and on. Paint the walls nearest to the stacks, even! Delineate the teen center from the rest of the library. Whatever you choose to do, try to do it with a few teen volunteers. Making them a part of the library gives what you do that much more meaning. I know that there are many articles, workshops, and blog entries circulating on teen spaces.Most of these revolve around the physical trappings of the area:what furniture did we buy, how did we find the space, what paint colors did we use, etc. Most prominently, they state how they got the money for this project. Who gave it, and how did we talk them into it? Having a teen space is seen as a vital part of serving teens. But where does that leave libraries that, for whatever reason, can’t get the funding?Or what if, no matter how supportive your administration is, they can’t enlarge your teen space any more than it is? I’ve been waiting a few days to write about the Teen Third Space because I’ve been allowing it to sink in. I work in one of the oldest branches of my system. The teen space has one long table dominated by laptop users. Luckily we have a significant chunk of shelving, but the books aren’t new and shiny. In fact, everything is old, uncomfortable, and stained. The only thing that makes the teen area a teen area is the fact that it says “Teen” on the wall. Cuz there aren’t any teens sitting there. They’ll go anywhere else in the library to hang out, but do not want to be in the teen space at all. As the incoming teen librarian at this branch it is *the* major thing I need to fix.